Fusing two classic PANDORA elements - delicate hearts and stone embellishments - this signature ring is a true style statement. 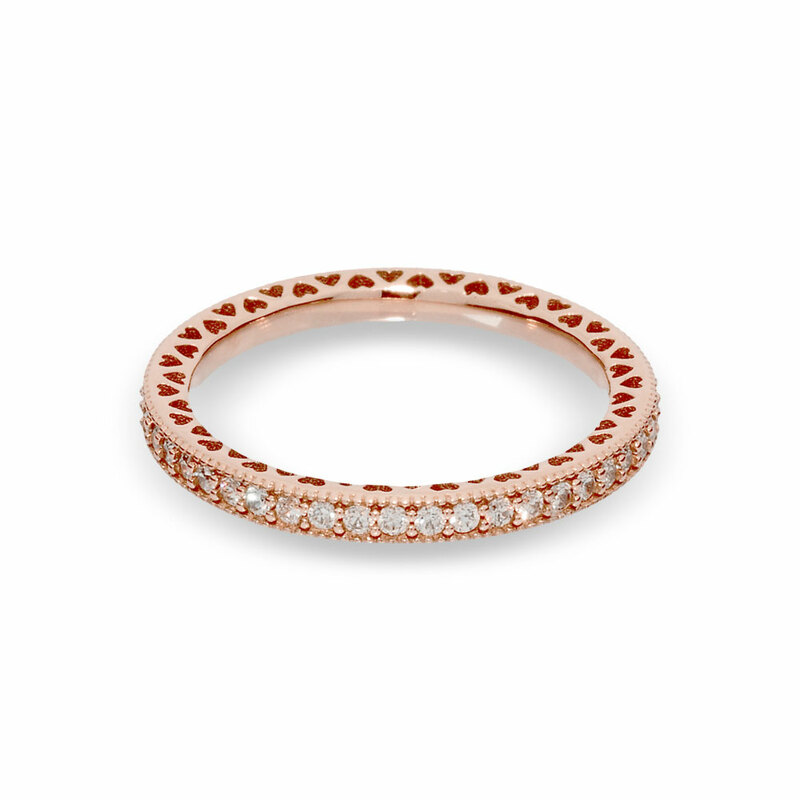 An essential part of any ring stack, the rose-coloured eternity ring design can be paired with virtually any stackable PANDORA ring design. PANDORA Rose is composed of a unique blend of metals giving it a romantic blush colour. Treat yourself, or spoil someone special by shopping this fabulous ring online or in any concept store. PANDORA Rose Hearts of PANDORA Ring is rated 4.7 out of 5 by 92. Rated 2 out of 5 by Rose B from Beautiful.... for less than a year I received two of these rings along with another silver one for my birthday less than a year ago as a promise from my long-time boyfriend. I loved the look of the rose gold with the silver in the middle. Recently, one of the stones fell out of one of them so I had it replaced (Pandora has an AMAZING life-time warranty and replace damaged rings without question). The contrast between the older rose gold and the new one was obvious and kind of embarrassing.... The old one is now a tarnished silver and the new one is the sparkling rose gold I remember. I was a little surprised that my ring had deteriorated at such speed - they don't even look like the same ring! The rose gold is just a thin coat over a normal silver color. Be warned - they might not be worth the extra money if you're looking for a long-term shine. Rated 5 out of 5 by JasmineM11 from Elegance My boyfriend bought this as a gift for me and I am absolutely in love with it! Rated 5 out of 5 by imjenn from I’m in love. My boyfriend bought this about 2 months ago for me as a promise ring / future wedding band. It hasn’t left my finger since and is just SO beautiful. It sparkles in the sun. The only downside is that I’ve gotten lotion and soap stuck in the little hearts around the band lol, but that’s my fault. Rated 5 out of 5 by Kanaka75 from Quality I recently got my wife the Pandora rose ring with the bow on top of it, from a store. When I went to a different store to get the bands to go with it, they didn't have it. This is the way the store had it displayed, and I thought it was very nice. So I came here. Got 2 bands, to finish the set and received them in a timely manner and on the exact day it said it would show up. I definitely plan on making more purchases from Pandora, and even referring people to your stores/ site. Rated 5 out of 5 by Frannyb from I love rose old and the beautiful diamonds My boyfriend bought me this ring with the matching earrings and Im in love, he bought it as a promise ring.